The E012G1L Series Heavy Duty Progressive Cavity Sludge Pump is ideal for high viscosity liquids and heavy waste solids in the sludge removal and dewatering processes in RAS and TWAS applications. The E012G1L Series Heavy Duty Progressive Cavity Sludge Pump is a standard ANSI flanged pump design manufactured with high strength cast Iron or 316 Stainless Steel pump casings and designed in 1, 2 and up to 4 stages for 85, 170, 350 psi discharge pressures making it an ideal low-cost, maintenance free drop-in replacement pump. 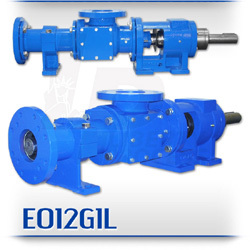 Standard suction and discharge flange size for the E012G1L is 4″. The E012G1L Series Heavy Duty Progressive Cavity Sludge Pump’s modular design comes with a positively sealed, hardened gear joint assembly, hardened tool steel rotors or stainless steel rotors both with hard chrome plating for long-life pumping and a wide selection of stators in Buna Nitrile, Viton®, EPDM and Natural Rubber.